I have always loved this activity and I wanted to share this quickly in a post! I love tasty science lessons and when you can get fourth graders excited about writing and science together it is a win/win! Can I just say POPCORN CONSTELLATIONS! 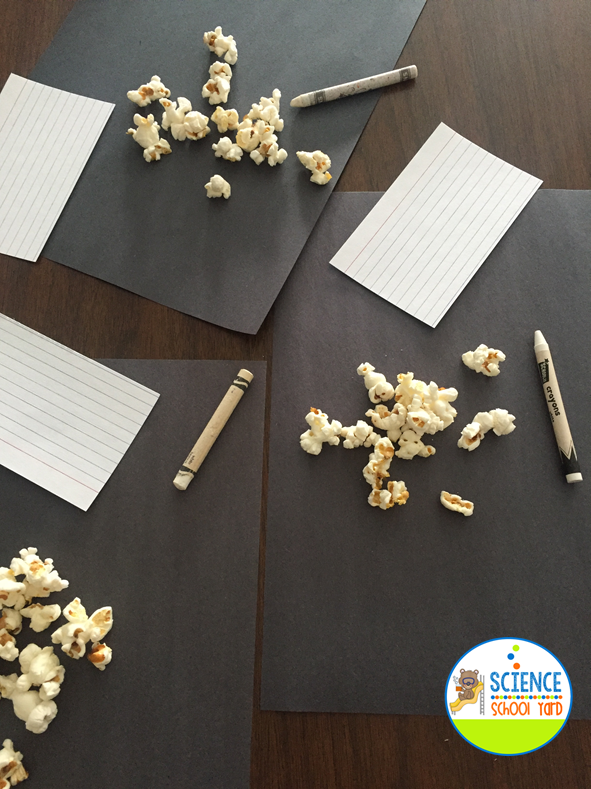 Yes, popcorn constellations! 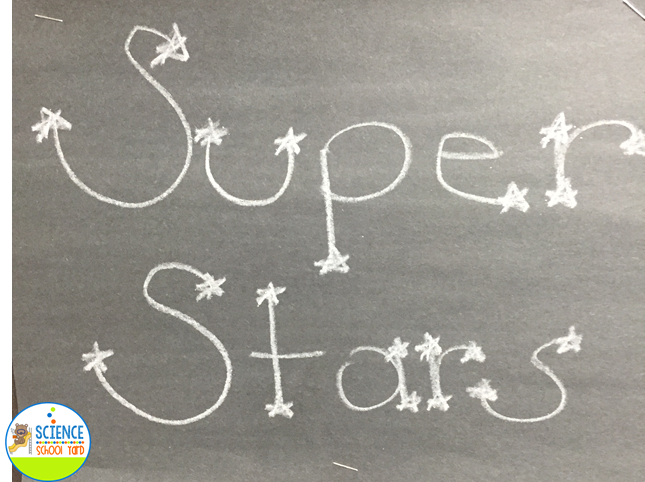 I start with a quick discussion about some super stars we will be learning about today...the constellations! I share with them the video Crash Course Super Stars! 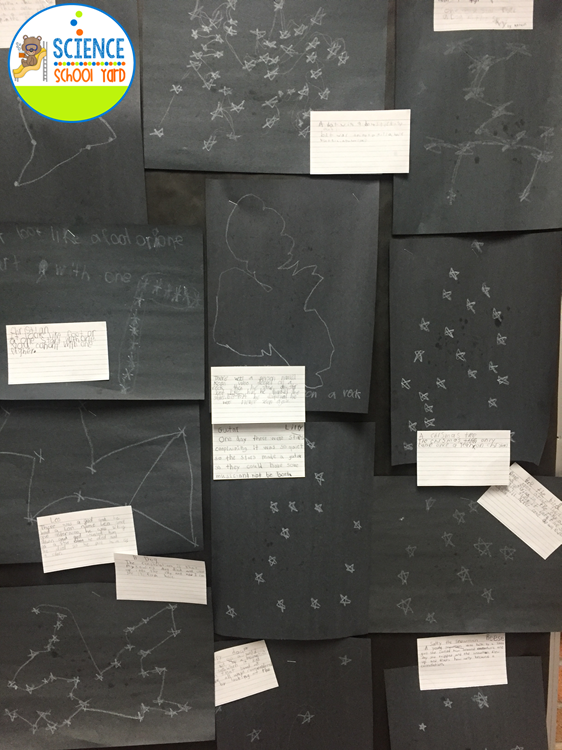 While I do that I set out a piece of black paper for each child, along with a white crayon (or chalk), a note card with lines, and a Dixie Cup of popcorn. will be making Popcorn Constellations. I demonstrate, by tossing the popcorn onto the paper, too many pieces makes it harder for them to find a figure...I then pick up a piece and pop it into my mouth! I replace it with a white star mark to show where the popcorn once was. I continue to do that until I eat all the popcorn and have white stars on my paper. I then turn the paper in all directions until I see something. I then devise a story as to how the constellation got there in the sky. I then send them back to do the same thing on their own papers. I love how they try to help each other figure out what they see. Some are easier than others, some may need a bit of help. When they are through with their stories, we share the title or the story with each other. While we are waiting for the class, I let them figure out their zodiac sign and read a kid friendly horoscope. We compare it to a fortune cookie or the paper at a Chinese restaurant. I then complete my lesson by sharing an activity with flashlights comparing the closeness of stars and their brightness. We can all be super stars with this one! How fun! What a creative way to get kids engaged. Thanks for sharing! Thanks so much Jan. We call it tasty Science! It isn't always easy to find something engaging during a solar system unit...this one is so fun!